Getting your patient’s to purchase frames from your optical dispensary is getting harder than it used to. Now, with more options, your patients can take their prescription to online retailers, taking profits away from your practice. Implementing a process can help you and your staff meet your patient’s need while increasing your profits. 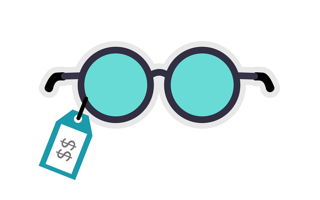 Below tips to help you create an effective optical dispensing sales strategy. Whether your patient enters your optical shop from the street or from the exam room, the way you greet the patient sets the stage for a potential sale. Greeting each patient as if they are an old friend will make them feel more comfortable and may help the patient open up about what they are looking for. Additionally, flashing a genuine smile can improve your optical dispensing sales and help build trust, lower stress, and can increase patient spending. After you greet the patient, it’s time to go into detective mode to figure out what’s going to work best for them. Asking open-ended questions and using active listening skills will help you discover more about the patient’s lifestyle and fashion preferences. Once you’ve discovered what you patient is looking for, you can start educating them on the options that would help them meet their needs. This is why it’s vital that you know the products, price points, and value of the products you’re offering. When you pitch the products to your patients, lead with value and focus on the patient benefits to help influence their decision. After you have spent some time helping your patient select a few frame options, work with them to narrow down the selection and complete the optical dispensing sale. If the patient expresses objections to your selection or is hesitant on completing the sale, go back to the discovery step to gather more information, then educate, and close.